Puerto Rico is a self-governing unincorporated territory of the United States of America. It is an island archipelago, consisting of the main island of Puerto Rico, as well as several smaller islands and keys, and is located in the Caribbean Sea, to the East of the Dominican Republic, and to the West of the Virgin Islands. The first people to reach Puerto Rico are believed to have reached the island around 2000 BCE. The details of early settlement are obscure, since the native peoples were later almost entirely wiped out during the early Spanish period. The Spanish period began in 1493 with the arrival of Christopher Columbus, on his second voyage - by 1508, the Spanish had appointed their first governor (Juan Ponce de León). For almost four hundred years, despite attacks by Britain, France, and the Netherlands, and several revolts, Puerto Rico remained a Spanish colony. In 1898, during the Spanish-American war, US forces invaded Puerto Rico, and a result of that, and the subsequent Treaty of Paris which ended the war, Puerto Rico has been a US territory ever since. Puerto Rican cuisine has developed an interesting cuisine, derived from many diverse sources, in part as a result of a combination of these historical influences, as well as of course exploiting local ingredients. Some dishes are derived from the original Amerindian inhabitants of the island, there are also many dishes influenced by Spanish cuisine, and of course, US cuisine has also left its mark. Albondigón - Puerto Rican meatloaf. Alcapurrias - Dough is made from green bananas and taro root, stuffed with meat or crab, and then fried. 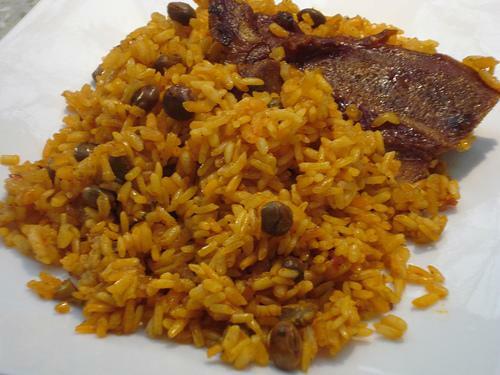 Arroz con gandules - Rice with pigeon-peas, flavored with sofrito (a thick cooked sauce, inspired by Spanish cuisine), and served with smoked ham. Arroz con pollo - Rice and chicken. Carne Guisada - Beef stew. Cuajitos en salsa - Pork belly in a hot sauce. Jibarito - Meat, cheese, salad and mayonnaise served between slices of fried plantain (a plantain sandwich). 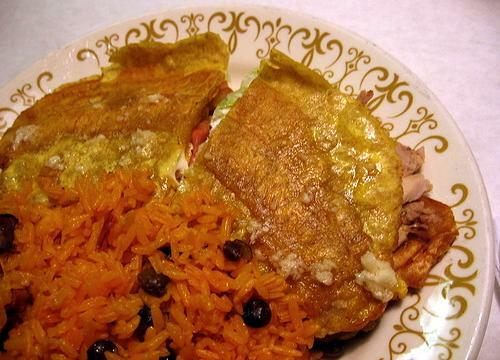 It is often served with Spanish rice, and is very popular among Puerto Ricans living in the mainland United States. Mofongo - Green plantains or yuca fried in olive oil with garlic and pork cracklings. It is served mashed with chicken soup or meat. Pollo frito - The Puerto Rican version of fried chicken. Taquitos - A stuffed tortilla, deep-fried. Similar to Mexican cuisine's chimichanga. Discover over 50 authentic recipes from Puerto Rico. Puerto Rican cuisine has its roots in the cooking traditions and practices of Spain, Africa and its native Taínos. More recently the cuisine of Puerto Rico has been greatly influenced by the United States. Puerto Rican cuisine has transcended the boundaries of the island and also has a lot of Asian influence especially Japanese and Chinese, and can be found in several other countries. Grab your copy of Puerto Rican Cuisine now! Puerto Rican cuisine holds a unique place in the culinary world with its blend of Spanish, African, and Native Caribbean influences. In Puerto Rican Cuisine in America, Oswald Rivera shares over 250 family-favorite recipes that explore this one-of-a-kind style of Caribbean cooking. There is everything from hearty soup like Sancocho to savory delicacies such as Cabro Borracho (druken goat) and Camarones Guisados (stewed shrimp) to rich desserts like Flan de Calabaza (pumpkin flan). Plus, with a suggested wine pairing for every dish and 90 delicious drink recipes, readers can enjoy the perfect Puerto Rican meal. Throughout the book, Oswald explores Puerto Rico's unique history, its people's migration to New York City, and his youth growing up in Harlem, as well as the growth of the Nuyorican culture in the United States. Refreshed with new illustrations throughout, this edition features a new preface by the author. Foodies and lovers of Carribbean cooking will be inspired by the authentic Puerto Rican recipes in Yvonne's Ortiz's essential cookbook, A Taste of Puerto Rico. Yellow rice, papayas, guavas, pina coladas, adobo, cilantro, and recaito—color, spirit, and sun-splashed flavor identify the national cuisine of Puerto Rico. A Taste of Puerto Rico is the first major cookbook in years to celebrate the vibrant foods of Puerto Rico, from hearty classics to today's new, light creations. Culinary professional Yvonne Ortiz captures the very best of island cooking in 200 recipes for every course. Adapted for the modern kitchen but completely authentic, these wonderful dishes, bursting with tropical tastes, bring a rich and diverse culinary heritage to your table. Puerto Rican food is as different in flavor and appearance as Puerto Ricans. Just as our mixed and varied heritage, our cuisine is a blend of many cultures, Taino Arawak, Spanish, African, Italian, French and American. It is this distinctive blend of local ingredients with cultural recipes that make it so unique. Enjoy regional Puerto Rican cuisine prepared by the best cooks in San Germán, Puerto Rico. Most Popular Puerto Rican Recipes Quick & Easy! This Puerto Rican cookbook focuses on 19 favorite dishes of the people of Puerto Rico, authentic recipes that you will find if you walk into any Puerto Rican home! All recipes are well known throughout Puerto Rico and form an essential part of traditional Puerto Rican cuisine. Have you been to Puerto Rico? Re-live your fantastic vacation again and again! Use this cookbook to re-create those wonderful dishes within the comfort of your own home and bring the Puerto Rican atmosphere to life. Impress your loved ones and friends! Produce mouth-watering dishes to add to your cooking repertoire and complement your party or gathering with authentic Puerto Rican food. Simple recipes, using easy to find ingredients. 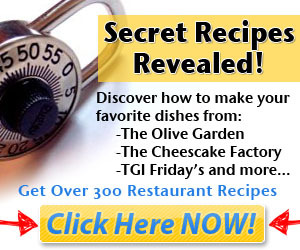 Includes suggestions for dishes that best complement each recipe. If you are already familiar with Puerto Rican Cuisine, then enhance your skills. These recipes will show you how to Cook Puerto Rican food the right way. Continue the tradition, teach and pass on these recipes to family members. Begin your flavorsome journey today…Scroll up and buy now! Available for the first time in English, Cruz Miguel Ortiz Cuadra's magisterial history of the foods and eating habits of Puerto Rico unfolds into an examination of Puerto Rican society from the Spanish conquest to the present. Each chapter is centered on an iconic Puerto Rican foodstuff, from rice and cornmeal to beans, roots, herbs, fish, and meat. Ortiz shows how their production and consumption connects with race, ethnicity, gender, social class, and cultural appropriation in Puerto Rico. Using a multidisciplinary approach and a sweeping array of sources, Ortiz asks whether Puerto Ricans really still are what they ate. Whether judging by a host of social and economic factors--or by the foods once eaten that have now disappeared--Ortiz concludes that the nature of daily life in Puerto Rico has experienced a sea change.